Matt Keightley is the Garden Designer bringing to life the RHS Chelsea Flower Show Feel Good Garden for 2018. With health and wellbeing now in the media almost every day, there has never been a more appropriate time to look at the mental and physical benefits of gardening. 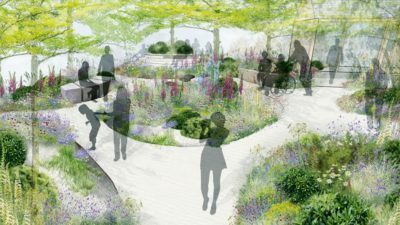 To mark the 70th birthday of the NHS, the RHS Feel Good Garden is one garden among those designed to raise awareness of horticulture’s positive impact on mental health. 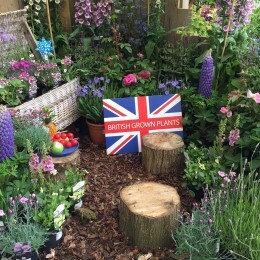 After the show, the garden is being relocated to the Camden and Islington NHS Foundation Trust, providing a place where staff and patients can garden, relax and be close to nature. 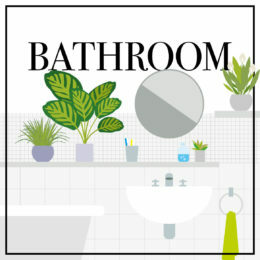 Day 1 of our 5 day ‘Inspired by RHS Chelsea 2018’ series focuses on using mostly cool-toned colours throughout your garden with the aim to create a peaceful space for you spend time in during times of stress and to aid clarity of thoughts! You can literally change your mood with colour and apparently the colour blue comes out top for the nation’s favourite. Blue is around us all the time and epitomises soothing hues. Stronger blues like French blue can actually have a stimulating effect so mix these colours with White which symbolises clarity and freshness and add pale pink and lavender mauve to create a soothing palate. Add in a focal colour like Matt has done by adding deep pink / burgundy colour. 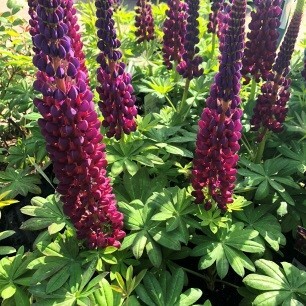 Matt has used Lupins to add height to his beds and borders to give a rather English cottage feel to the RHS chelsea 2018 Feel Good Garden. 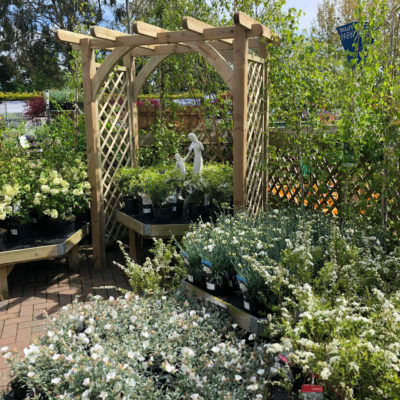 A border is a great way to transform an area in your garden choose an area which has space to include a structure or seating for you to relax and take in the wonderful aroma. 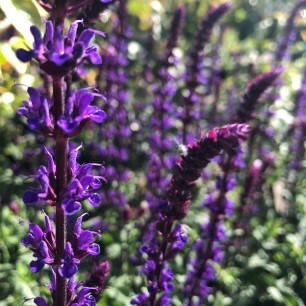 We love the soft bluey mauves of the Salvia which featured as Chelsea’s Runner-Up for Plant of the Year 2017. 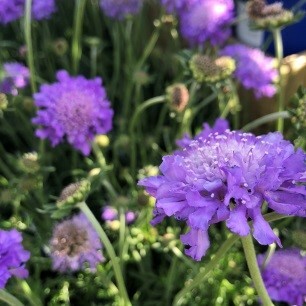 These add height to your borders and help create a cottage style garden mix with pretty pink Scabiosa ‘Pink Mist’ or the blue-lilac Scabiosa ‘Butterfly Blue Beauty’. Soften edges of a hard wall or building with a Clematis another winner from 2016. How can you resist the allure of their scented pale blooms which drape themselves through trees and over structures and make a dramatic impact from late spring to autumn time? 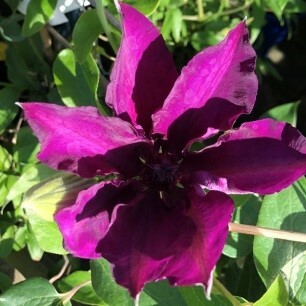 There are many variations which are dramatically displayed at Chelsea, we love seeing the Raymond Evison Clematis exhibit who have won 15 consecutive times. Here is their Clematis fleuri ‘Boulevard’ a rich deep pink burgundy flower that compliments lilac and pink colours perfectly for a splash of drama. Define edges with rows of Lavandula stoechas ‘Fathead’ or better known as French Lavender a fantastic pollinator with amazing scent and calming properties which is exquisite edging borders but equally as stunning in containers positioned around your seating area. 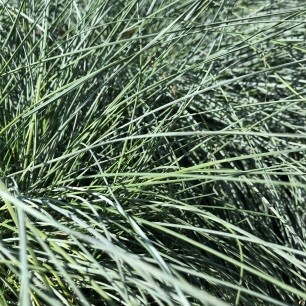 Add in some silver by choosing a blue grass like the Festuca glauca ‘Intense Blue’ which will blow softly in the breeze instantly transporting you back to that holiday spent on the dunes in Cornwall. 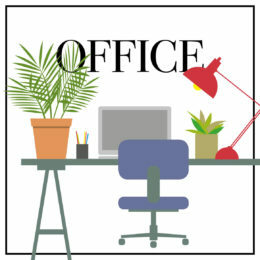 If you are creating a shady seating area, frame with evergreens or a small acer and then dot in some small low ferns which will thrive with minimal sunlight. 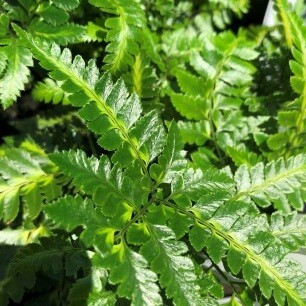 Evergreen ferns like the Arachnoides aristata variegate will layer the ground with rich dark green fronds to shift your mood from exciting bright sunshine to a restful, cool and thoughtful. 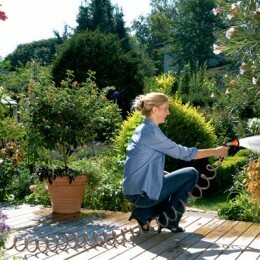 From a practical point of view, shady areas suffer less evaporation, so plants need less watering. 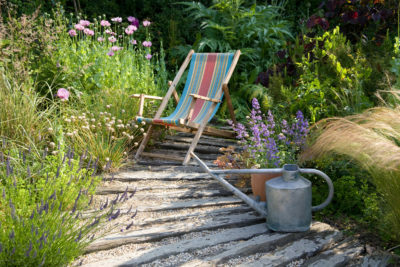 But, be warned, if you are creating a shady spot to relax in from scratch, dappled shade is the very best kind for gardening, especially when you are using small ornamental trees for the canopy, the soil underneath will then remain moist for the plants to flourish. 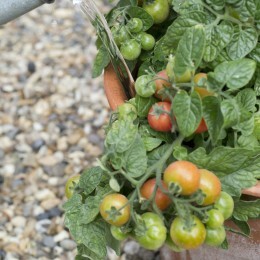 Top tip: If your shade is too dark to read, then it is likely to be too dark even for shade-loving plants.